← DON’T MISS THIS PAINTING WORKSHOP! 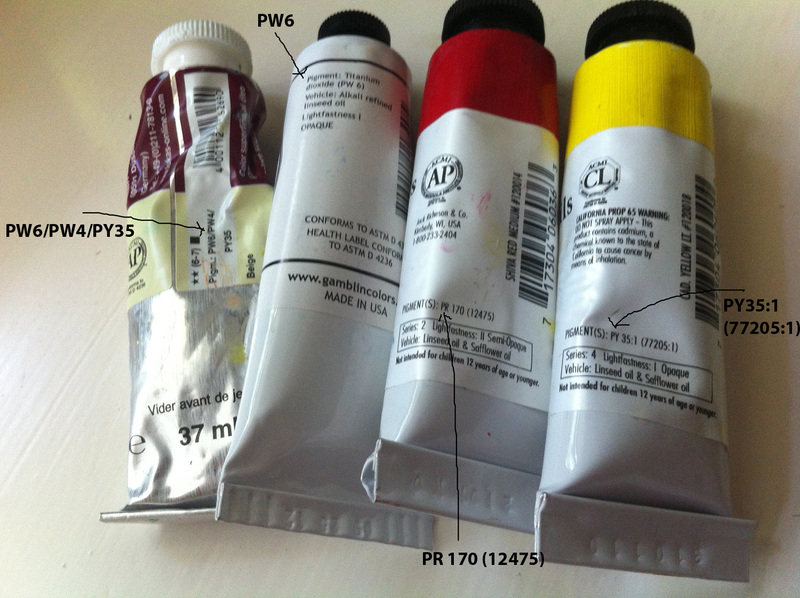 What is in a Paint Tube Label? There is a lot to learn by just looking at the label of a paint tube. Of course, the manufacturer’s name can usually be seen right away. Their address, phone number, and/or website is usually listed in smaller print. Whether it is an oil, an acrylic, or another medium is also clearly indicated as well as the volume of the paint tube in milliliters or fluid ounces. However, there is much more to learn by looking at the label that will help any artist in selecting the right paint for their work of art. The series on the label refers to the price group. Certain paints are more costly to manufacture according to the price of the pigment used to make them, the quantity and quality of the pigment, or simply the process. Manufacturers group the colors into price bands assigning a letter or a number to these bands which are also known as “Series”. Higher series number or series letters indicate a higher production cost and a higher price for the paint. For example a Series A is less expensive than a Series B. Consequently a Series 1 would be cheaper to manufacture than a Series 2. The picture illustrating this portion is an acrylic paint tube from Golden Artist Colors, an sponsor for NOAPS Best of America Exhibit 2014. 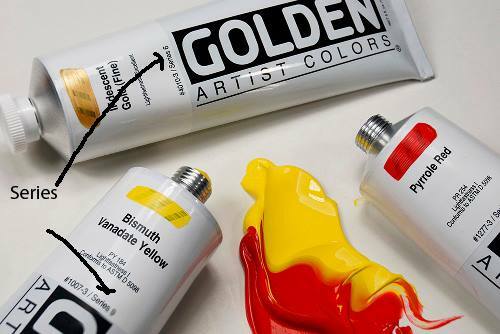 Golden Artist Colors is sponsoring the Best Acrylic Painting Award this year. 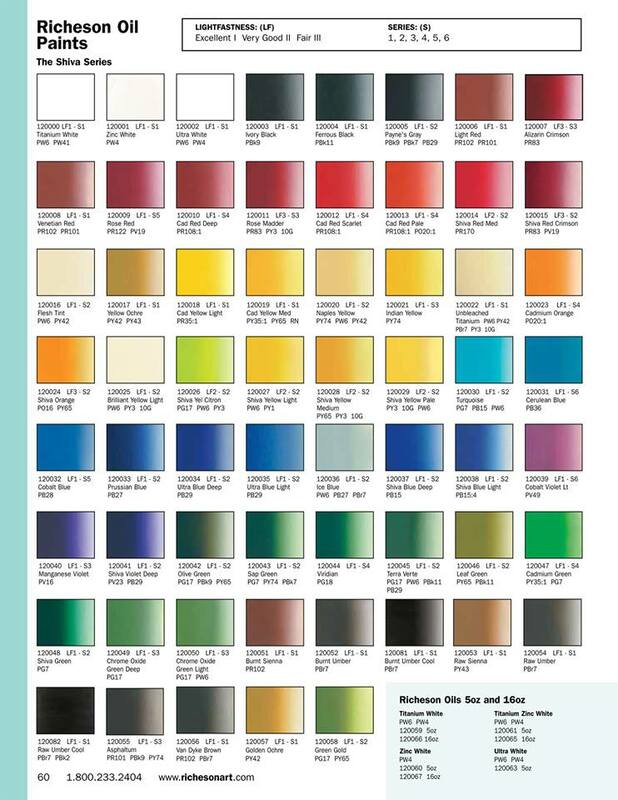 Lightfastness of a paint color or pigment is very important! It indicates how permanent, resistant to change, or how unaffected by light it is. Paint colors can fade or alter when exposed to light and time. This could change the look and quality of an art work. The British system (Blue Wool Standard) rates lightfastness One to Eight. Eight being Excellent and One being the worst. Look at the Lightfastness in the chart here for the Richeson Oil Paints Shiva Series, one of our sponsors for NOAPS Best of America Exhibit 2014. The requirements for health warnings may vary according to the country or even the state. 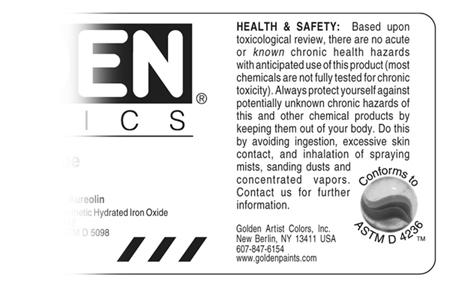 Specific information will be listed under a caution or warning on the label. It might also refer to ASTM conformity or present the ACMI Approved Product Seal. The ASTM International (American Society for Testing and Materials), “is a globally recognized leader in the development and delivery of international voluntary consensus standards. Today, some 12,000 ASTM standards are used around the world to improve product quality, enhance safety, facilitate market access and trade, and build consumer confidence” ( extracted from http://www.astm.org/ABOUT/overview.html). For more information refer to their site. This entry was posted in General, Uncategorized and tagged acrylic colors, Acrylic Painting, art supplies, oil colors, Oil painting. Bookmark the permalink.